Located in far southwest Georgia, Bainbridge began as a Native American trading post on the Flint River in 1765. In 1824, the town was officially established and named Bainbridge after the commodore who commanded the U.S.S. Constitution during the War of 1812. Jews did not settle in the small inland port town until after the Civil War. Among the first Jews in Bainbridge was Abraham Ehrlich, who came to the seat of Decatur County in 1869. Ehrlich had spent a few years in nearby Valdosta, where he was also one of the first Jewish settlers. Born in 1841 in the German town of Gehause, Ehrlich had peddled in the area in the years before the Civil War. When the war broke out, Ehrlich enlisted in the Georgia infantry. He was later seriously wounded in the arm at the Battle of Chickamauga, and spent over a year recuperating at a Savannah hospital. Despite his injury, Ehrlich soon went into business with the help of his brothers Henry and Lewis, who came over from Germany after the war. After a business in Valdosta failed, Abraham and Henry opened a dry goods store in Bainbridge. Lewis Ehrlich soon opened a butcher shop in town. By 1870, the three Ehrlich brothers lived together in Bainbridge; the unmarried brothers, Abraham and Henry, lived together next door to Lewis and his young family. The family was soon struck by tragedy, as Abraham died after his wounded arm became infected. Abraham was celebrated in the local newspaper as a Confederate hero who had sacrificed his life to the lost cause. Lewis and Henry Ehrlich remained in Bainbridge and became the foundation of the local Jewish community. The Ehrlich family was soon joined by other Jewish immigrants who were drawn to the burgeoning economic opportunity in the area. Another set of brothers, Max and Isadore Kwilecki, came to Bainbridge from Prussia, arriving by 1870. They owned a small store together. Isadore spent the rest of his life in Bainbridge, owning a hardware store that was passed down to his children. He married another Prussian-born immigrant, Bertha, and two raised seven children in Bainbridge. Isadore also got involved in real estate, building a two-story building in downtown Bainbridge. The first floor was rented out to various businesses, while the second floor was home to the Kwilecki Opera House, which presented traveling shows as well as local theatrical productions. Hehle Nussbaum, from Saxe-Weimar in Germany, opened a butcher shop in Bainbridge in 1871, where his Ehrlich brothers-in-law already lived. Two years later, Nussbaum brought over his wife Lena Ehrlich, and their three children to join him in Bainbridge. They had four more children in Bainbridge. Nussbaum opened a cooperage company in 1894 to make barrels for the local turpentine industry. Several of Nussbaum’s children became prominent Bainbridge citizens. Ben Nussbaum owned a furniture store with his brother Max, and was elected to the Georgia State Legislature in 1902, but died before he was able to serve. Max later owned a manufacturing company that made bottle washing machines. He served several years as alderman and was elected for one term as Bainbridge’s mayor. Sigmund Nussbaum founded Georgia’s first electric utility company, after he bought a steam engine to help him make ice to keep the beer he was selling cold. He later hooked the city’s electric lights into his generator. Melvin Nussbaum was a lawyer and businessman who spent many years as chairman of the Bainbridge Board of Education. These three families, the Ehrlichs, Kwileckis, and Nussbaums, became the pillars of the Bainbridge Jewish community; their descendants continued to play leadership roles in the community for the next century. Over the years, many Kwileckis, Ehrlichs, and Nussbaums served as president of the local congregation. By 1878, an estimated 53 Jews lived in Bainbridge. Most of the male breadwinners worked in retail trade. This growing number of Jews began to meet together. The women took the lead, forming a “Koffee Klatch” in the 1870s that met weekly and raised money for charity. This group later evolved into the Ladies Aid Society, and then the Temple Guild. In 1878, the Jewish men of Bainbridge founded a local chapter of B’nai B’rith. The group soon petitioned the city for a parcel of land in the town’s cemetery for use as a Jewish burial ground; they were given three-quarters of an acre. In 1900, the 18-year-old Rosalie Kwilecki, daughter of Isadore and Bertha, started a Sunday School. Rosalie had been teaching Judaism to her brothers and sisters, which soon attracted the attention of other Jews in town. The school initially met in the local Elk’s Lodge. Rosalie Kwilecki, who later marred Henry Ehrlich’s son Julian, ran the school for over 50 years. 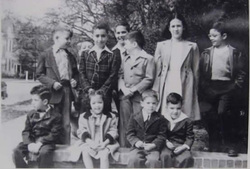 Soon after the religious school was established, Bainbridge Jews came together formally to establish a congregation. Founded in 1902 when the group acquired a Torah, Temple Beth-El initially met in private homes and the Elk’s Lodge. Isadore Kwilecki was its first president, a position he held for over 25 years. 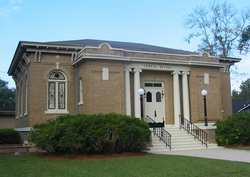 In 1909, the small congregation hired Rabbi Edmund Landau, of Albany, Georgia’s Temple B’nai Israel to come lead services in Bainbridge. Since Rabbi Landau served his own congregation on Friday nights and Saturdays, he would travel to Bainbridge on one or two Sundays a month to lead services. With encouragement from Rabbi Landau, Temple Beth-El soon began to raise money to build a synagogue. The Temple Guild, formally known as the Ladies Aid Society, played a key role in the fundraising process. In 1914, they bought a parcel of land at the corner of Evans and Broad Streets. In December of 1916, they officially dedicated their house of worship in a big public ceremony. According to the local newspaper, people of all faiths filled the new temple. Isadore Kwilecki led the procession into the building, and struck an interfaith note in his speech, inviting ministers and laity of all faiths to visit the synagogue, quoting the line from the Prophets, “my house shall be a house of prayer unto all nations.” W.H. Krause, who was head of the building committee, gave a speech thanking all of those, including local Gentiles, who had donated to the building fund. Rabbi Landau also took part in the ceremony, and Rabbi George Solomon of Congregation Mickve Israel in Savannah gave the keynote address. Temple Beth-El was always Reform. The German Jews who founded the congregation had little interest or opportunity in practicing Orthodox Judaism. Their worship services were on Sundays, and included very little Hebrew. After they dedicated their temple, the congregation soon instituted the confirmation ritual. 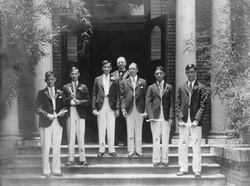 The first confirmation ceremony was in 1917. They also used an organ during worship services. According to temple lore, when they were raising money to buy the organ, they sent a solicitation letter to the famous Jewish philanthropist Julius Rosenwald, who sent a donation to the congregation. By 1945, the congregation had joined the Union of American Hebrew Congregations, the national organization of Reform Judaism. The Jewish community of Bainbridge thrived in the 1910s and 1920s. In 1919, the congregation had 24 children in its religious school. According to an estimate in the American Jewish Year Book, 220 Jews lived in Bainbridge in 1927. Much of this increase was due to the arrival of a handful of Jewish immigrants from Russia. Max Kline and his wife Sarah were born in Russia; Max owned a dry goods store in Bainbridge in 1920. His brother Will Kline was also a dry goods merchant in Bainbridge. Harry Grollman emigrated from Russia in the 1890s, and lived in Maryland before moving to Georgia with his wife Rae. These Russian Jews concentrated in the dry goods business. Of the six Russian-born household heads who lived in Bainbridge in 1920, five owned retail dry goods stores, while the sixth was a wholesale dealer in dry goods. In 1946, Romanian-born Jake Wolff moved to Bainbridge after serving in the Navy during the war. By 1949, he owned Jake’s Pawn Shop, which later became the last surviving Jewish-owned retail store in Bainbridge. From this peak in the 1920s, the Bainbridge Jewish community soon went into decline, most likely due to the economic effects of the Great Depression on the region. By 1937, according to the American Jewish Year Book, there were only 42 Jews in Bainbridge. Beth-El remained small; it reached a peak of 22 members in 1970, but usually fluctuated between 10 and 20 members. The congregation never had a full-time rabbi; instead, they brought visiting rabbis from nearby cities like Albany, Georgia, Tallahassee, Florida, and Dothan, Alabama. Rabbi Landau of Albany served Beth-El for over 25 years. For the High Holidays, Bainbridge Jews usually traveled to synagogues in other towns since their regular visiting rabbis were not available. On at least one occasion, in 1968, the congregation brought in a student rabbi from Hebrew Union College for the High Holidays. Despite the small size of the congregation, Beth-El built an addition in 1950, which included an assembly room, kitchen, and two religious school classrooms. They named the addition after Lester Friedman, a longtime leader of the congregation. Roslyn Palmer, a lifelong member of Beth-El, Palmer is very involved in Bainbridge’s civic affairs. She spent many years on the local city council. Historically, Jews had long been engaged in civic life in Bainbridge. Indeed, most Bainbridge Jews claim that they never faced significant anti-Semitism. Bertram Ehrlich, the grandson of Henry Ehrlich, was born and raised in Bainbridge. He took over the Ehrlich Drug Store from his father Julian, who had founded it in 1911. The drug store remained open for 66 years. Bertram was active in the Bainbridge Chamber of Commerce and became a beloved local figure. For a time, he gave daily broadcasts over a local radio show. In 1997, the city declared “Betram Ehrlich Day” in his honor. Other Jews have become an important part of the town’s cultural life. Paul Kwilecki, was an active member of Beth-El, and a photographer who spent his career documenting everyday life in Decatur County. He originally owned a hardware store in town, as had his Kwilecki ancestors, but sold it in 1975 to pursue his art full-time. Kwilecki won fellowships from the National Endowment for the Arts and the Guggenheim Foundation. He published two books of his photographs and his work is in the permanent collections of several museums, including the Museum of Modern Art in New York. Roslyn Palmer leading services in 2006. In recent decades, Beth-El and the Bainbridge Jewish community have continued to decline. The religious school disbanded in the 1970s when there were no longer enough children in the congregation. The few children who remained would travel to other cities in the area for education. Despite this, Beth-El continued to bring in visiting rabbis on a regular basis. Rabbi Elijah Palnick of Albany was the last of these visiting rabbis, serving Beth-El from 1987 to 1999. Since 1999, the congregation’s monthly services have been lay-led. Despite its declining numbers, Beth-El has persevered. In 2006, the congregation celebrated its anniversary and held a homecoming event. People who had been raised in Bainbridge came back to celebrate Beth-El’s long history. Rabbi Irvin Ehrlich, who grew up in Bainbridge and was the grandson of Rosalie Ehrlich, led the service. The mayor of Bainbridge, the head of the County Board of Commissioners, and the minister of the First United Methodist Church all took part in the ceremony. 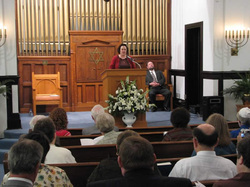 Showing the congregation’s commitment to classical Reform Judaism, the homecoming service was almost entirely in English. Beth-El continues to use the old Union Prayer Book. This commitment to long-held traditions is understandable in a small congregation of just eleven members. Despite its small size, Beth-El remains committed to preserving its synagogue building, which has long been the center of gravity of the Bainbridge Jewish community. 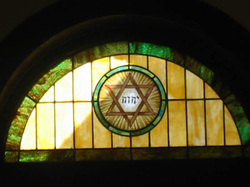 Jews have lived and worshiped in Bainbridge, Georgia since the late 19th century. The community has remained small though remarkably stable throughout its 130-year history.